I purchased this book having been a fan of Irene Hannon's for some time even though I've missed a few of her more recent releases. So I thought it was time to pick one up. Here's the blurb, and we'll chat on the other side. 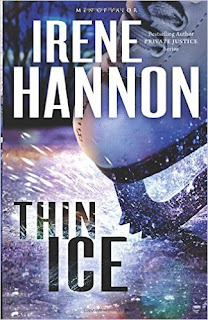 If you've read Hannon's romantic suspense books before, you'll note they take a similar pattern--which I believe is more due to the genre guidelines and expectations than the author's writing ability. So for those of you who have loved her books in the past, this one will be no exception. Hannon creates fresh characters in each of her books, typically with her male lead in law enforcement of some kind. Lance is no exception. Still, he carries his own voice and backstory, and I found I liked him very much. I also enjoyed that Christy is a figure skater, which was a new background Hannon has yet to explore with her characters. You could tell she'd researched this sport, and it added a depth to Christy's story that only made her more enjoyable to read. The suspense aspect of the story unfolded at a nice pace, as did the romance angle. While I can't say there were too many surprises, the plot kept me turning pages, and I was always happy to pick the story back up whenever I'd been forced to set it down for any period of time. Hannon is a trusted author whose books always deliver and one I will happily read again. I give Thin Ice 4 out of 5 stars and you can purchase it here.